For the last 14 months, we’ve been working vigorously to develop a small hybrid wood and coal stove for the Navajo Nation - a stove that is clean, efficient and inexpensive. The development of that stove is finished, and we’ll begin shipping Navajo Stoves to the Navajo reservation in late December/early January. 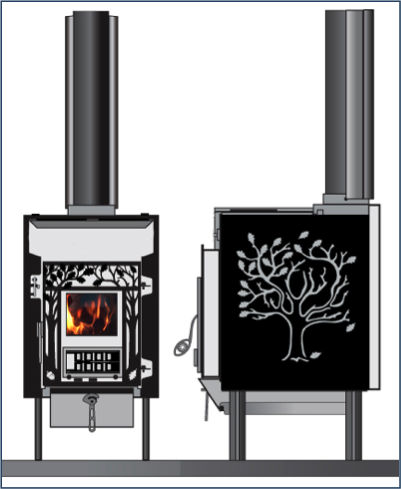 Now we want to introduce the related Survival Stove - a small hybrid wood stove which we will also begin shipping at the end of this year. 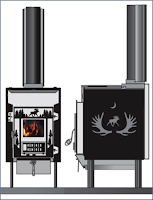 This stove shares the same wood combustion technology as the Navajo Stove and is designed to heat about 1,000 sq. ft., with a hybrid combustion system that is 79.43% efficient, has average emissions of 1.05 gm/hr and produces 15,332-27,294 BTU/hr under the current EPA test protocols. The Survival Stove has been a big hit with our internal beta testers. 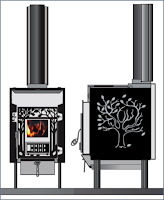 The firebox is small (1.15 cu ft) but the stove puts out a lot of heat. It’s very clean and very efficient. It doesn’t take up too much space - the hearth pad for this stove is just 32” wide x 40” deep. Clearances are just 9” from the corners, sides and back to combustible walls. Height is adjustable. Each stove comes with an ash pan and all close-clearance shields. We have also designed three tools (poker, ash rake, and shovel) that hang from the side shield. Specifications and prices to follow in the next few days!